Text: Song of Songs 8:6-14, Prologue to Wisdom, and Wisdom 1:1-2:7 (recto). A scan of the verso is not currently available. 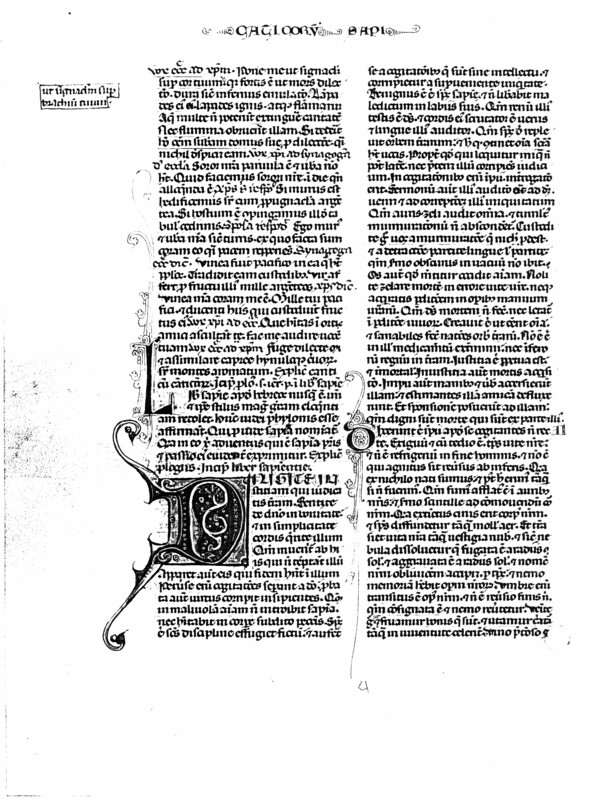 The translation of the prologue, which is a Jerome apocrypha, is by Catherine Kavanaugh. Póne me ut signáculum super cor tuum, ut signáculum super bráchium tuum, quia fortis est ut mors diléctio, dura sicut inférnus aemulátio: lámpades ejus lámpades ignis atque flammárum. Aquae multae non potuérunt extínguere caritátem, nec flúmina óbruent illam. Si déderit homo omnem substántiam domus suae pro dilectióne, quasi nihil despíciet eam. Sóror nostra parva, et úbera non habet; quid faciémus soróri nostrae in die quando alloquénda est. Si murus est, aedificémus super eum propugnácula argéntea; si óstium est, compingámus illud tábulis cédrinis. Ego murus, et úbera mea sicut turris, ex quo facta sum coram eo, quasi pacem repériens. Vínea fuit pacífico in ea quae habet pópulos: trádidit eam custódibus; vir affert pro fructu ejus mille argénteos. Vínea mea coram me est. Mille tui pacífici, et ducénti his qui custódiunt fructus ejus. quae hábitas in hortis, amíci auscúltant; fac me audíre vocem tuam. Fuge, dilécte mi, et assimiláre cápreae, hinnulóque cervórum super montes arómatum. Explicit canticum canticorum. Incipit prologus sancti Ieromini presbyterii in liber sapientie. Liber Sapientiae apud Hebraeos nusquam est: unde et ipse stylus Graecam magis quam Hebraeam eloquentiam redolet. Hunc Judaei Babylonis esse affirmant; qui proinde Sapientiae nominant, quia in eo Christi adventus, qui est sapientia Patris, et passio ejus evidenter exprimitur. Explicit prologus. Incipit liber sapientie. 6 Put me as a seal upon thy heart, as a seal upon thy arm, for love is strong as death, jealousy as hard as hell, the lamps thereof are fire and flames. 7 Many waters cannot quench charity, neither can the floods drown it: if a man should give all the substance of his house for love, he shall despise it as nothing. 8 Our sister is little, and hath no breasts. What shall we do to our sister in the day when she is to be spoken to? 9 If she be a wall: let us build upon it bulwarks of silver: if she be a door, let us join it together with boards or cedar. 10 I am a wall: and my breasts are as a tower since I am become in his presence as one finding peace. 11 The peaceable had a vineyard, in that which hath people: he let out the same to keepers, every man bringeth for the fruit thereof a thousand pieces of silver. 12 My vineyard is before me. A thousand are for thee, the peaceable, and two hundred for them that keep the fruit thereof. 13 Thou that dwellest in the gardens, the friends hearken: make me hear thy voice. 14 Flee away, O my beloved, and be like to the roe, and to the young hart upon the mountains of aromatical spices. Here ends the Song of Songs. Here begins the prologue of Saint Jerome the Presbyter to the book of Wisdom. The Book of Wisdom is found nowhere among the Hebrews, as a result of which it is far more redolent of Greek style than of Hebrew eloquence. The Jews affirm this to be Babylonian. Therefore they call it Wisdom, for in it the coming of Christ, who is the Wisdom of the Father, and His Passion, is evidently expressed. Here ends the prologue. Here begins the book of Wisdom. 1 Love justice, you that are the judges of the earth. Think of the Lord in goodness, and seek him in simplicity of heart. 2 For he is found by them that tempt him not: and he sheweth himself to them that have faith in him. 3 For perverse thoughts seperate from God: and his power, when it is tried, reproveth the unwise: 4 For wisdom will not enter into a malicious soul, nor dwell in a body subject to sins. 5 For the Holy Spirit of discipline will flee from the deceitful, and will withdraw himself from thoughts that are without understanding, and he shall not abide when iniquity cometh in. 6 For the spirit of wisdom is benevolent, and will not acquit the evil speaker from his lips: for God is witness of his reins, and he is a true searcher of his heart, and a hearer of his tongue. 7 For the spirit of the Lord hath filled the whole world: and that, which containeth all things, hath knowledge of the voice. 8 Therefore he that speaketh unjust things cannot be hid, neither shall the chastising judgment pass him by. 9 For inquisition shall be made into the thoughts of the ungodly: and the hearing of his words shall come to God, to the chastising of his iniquities. 10 For the ear of jealousy heareth all things, and the tumult of murmuring shall not be hid. 11 Keep yourselves therefore from murmuring, which profiteth nothing, and refrain your tongue from detraction, for an obscure speech shall not go for nought: and the mouth that belieth, killeth the soul. 12 Seek not death in the error of your life, neither procure ye destruction by the works of your hands. 13 For God made not death, neither hath he pleasure in the destruction of the living. 14 For he created all things that they might be: and he made the nations of the earth for health: and there is no poison of destruction in them, nor kingdom of hell upon the earth. 15 For justice is perpetual and immortal. 16 But the wicked with works and words have called it to them: and esteeming it a friend have fallen away, and have made a covenant with it: because they are worthy to be of the part thereof.